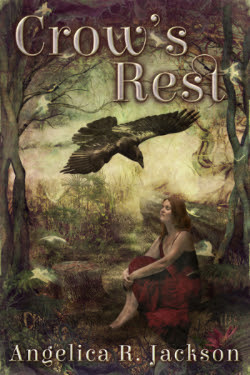 Today, I’m helping fellow Fearless Fifteener Angelica R. Jackson reveal her new book trailer for her debut novel, Crow’s Rest, which releases May 15 with Spencer Hill Press. Avery Flynn arrives for a visit at her Uncle Tam’s, eager to rekindle her summertime romance with her crush-next-door, Daniel. But Daniel’s not the sweet, neurotic guy she remembers–and she wonders if this is her Daniel at all. Or if someone–or something–has taken his place. Her quest to find the real Daniel–and get him back–plunges Avery into a world of Fae and changelings, where creatures swap bodies like humans change their socks, and magic lives much closer to home than she ever imagined. Angelica R. Jackson, in keeping with her scattered Gemini nature, has published articles on gardening, natural history, web design, travel, hiking, and local history. Other interests include pets, reading, green living, and cooking for food allergies (the latter not necessarily by choice, but she’s come to terms with it). Ongoing projects include short fiction, poetry, novels, art photography, and children’s picture books.In 2012, she started Pens for Paws Auction, which features critiques and swag from agents and authors to raise money for a no-kill, cage-free cat sanctuary where she volunteers, Fat Kitty City. She’s also been involved with capturing the restoration efforts of Preston Castle in photographs and can sometimes be found haunting its hallways. Here’s a post about the making of the trailer.